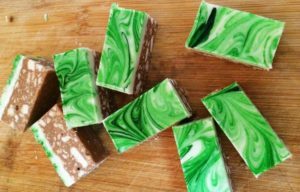 EASY Chocolate Peppermint Slice - Green Marble! What is better than a home made desert? The answer is one that you don’t have to bake! Yes, this delicious Chocolate Peppermint Slice dessert is also a no bake method, meaning that prep time and ‘cooking’ time is 15 minutes! 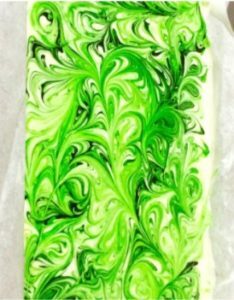 Although this recipe uses green swirls for this easy Chocolate Peppermint Slice, you can use pink/blue/purple if you wish! Perfect for if you’re going to a themed birthday party or event. 1-2 tiny drops peppermint essence be careful – it’s powerful stuff!! Crush the biscuits in a food processor (don’t worry if there are still a fair few bigger chunks… that’s fine!) and then pour into a mixing bowl. Melt butter, block of peppermint chocolate and condensed milk in a saucepan over a very low heat. Mix until smooth. Pour warm chocolate mixture onto the biscuits and mix well. Very carefully add two tiny drops of peppermint essence and mix well. Meanwhile, melt the chocolate in the microwave on low (stirring regularly) and pour over the cooled slice. Pop into the fridge until just set (tacky to the touch but not hard).